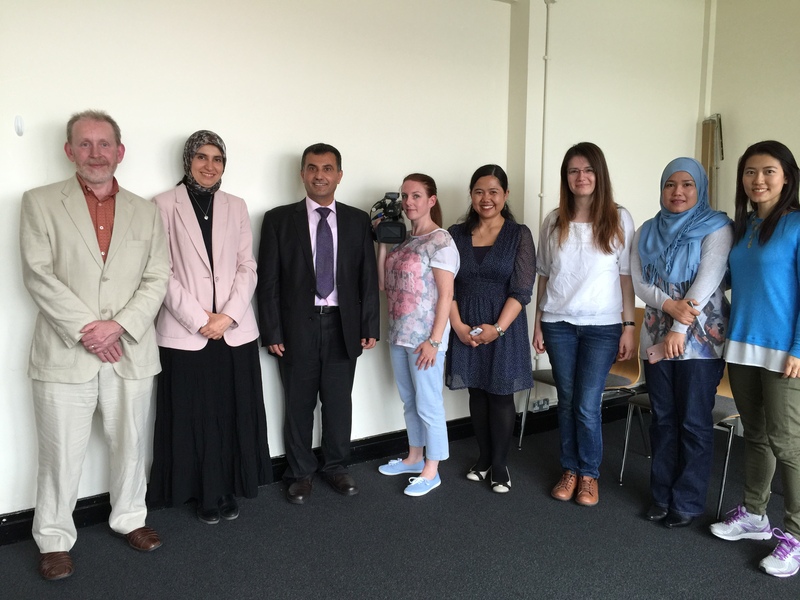 Last Thursday we were very privileged to have Prof. Nazmi Al-Mari from the Islamic University Gaza (IUG) with us for an hour or so. Nazmi, an alumnus of the University of Manchester, had managed to leave Gaza for a few days in a seemingly rare opening of the borders. We are very grateful that he managed to make Manchester a part of his hectic schedule and also to Mariam Attia for accompanying him. Nazmi told us about the work he is doing as part of the AHRC Researching Multilingually at Borders project for which he is pioneering an online course for Arabic as a Foreign Language. He explained that the main reason for the course being online as opposed to face to face, is due to the political situation in Gaza and the lack of free movement in and out of the Gaza strip. He described the challenges of 2 million people living in a strip of land just 30 miles by 8 miles in area, surrounded by barbed wire. He also spoke of the resilience and perseverance that his university in particular is showing in a situation of great adversity. For example, when two of the key buildings containing huge amounts of equipment and facilities were bombed, it took just two weeks to find alternative ways of delivering the classes that had been held there. Nazmi said that the core ethos of the IUG is one of serving the community and explained how they are constantly looking for ways to enable students from all backgrounds and situations to study. A recent innovation has been offering courses for those who are now deaf as a result of the constant bombing. The economic situation in Gaza is grim, in part because of the lack of freedom of movement in and out of the area, so all funding for programmes has to come from outside. Nazmi has sent us a link to the Just Giving page of the charity launched by IUG called ‘Donate to Educate’, for anybody who would like to be involved in giving. Kelly filmed the conversation and we will provide a link for that as soon as it becomes available.